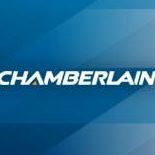 Chamberlain is Your Welcome Home®. As a manufacturer of some of the world’s most reliable, efficient, and cost-effective home control products, Chamberlain is determined to build its established reputation as the industry leader. We offer high performance garage door openers and smartphone-enabled products designed for do-it-yourself installation. We make customer satisfaction our number one priority by providing the best product support available. Our 40 years of experience helps us deliver safety, security, and convenience to you in every product we manufacture, whether it be a garage door opener, wireless accessory, or any of our other smartphone connected products. Stay in control with MyQ smartphone control. Designed to work with garage door openers that use safety reversing sensors located at the bottom of the garage door track. Make home access easier with Chamberlain's MyQ Garage Door Opener! 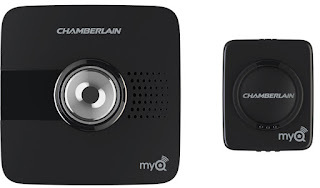 Chamberlain's MyQ Garage Door Opener has come in handy so many times for me and my family. I absolutely love that I can finally leave the house and not have to wonder if I left the garage door open. I can simply check the free app to verify that it's closed. I also love that I can open the garage when I'm not home to let someone in if I need to. I've done this a few times for my mom so she could grab something because even though she has a key she often forgets it. My husband was able to install the Chamberlain MyQ Garage Door Opener in minutes and had it up and running with absolutely no problems whatsoever. 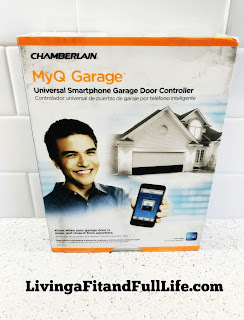 Chamberlain's MyQ Garage Door Opener is absolutely amazing and I highly recommend it! It would make a terrific Father's Day gift this Father's Day!